If you can’t find the time to do anything else – cleansing your skin is a must! Don’t worry guys; cleansing is just a fancy word for washing your face. This should be done every morning and every evening before bedtime. Just because you can’t see the dirt and grime on your skin, doesn’t mean that it isn’t there. Think about what you are exposed to on a daily basis: pollution, car exhaust, cigarette smoke, even room deodorizers. All of these little particles can land on your skin and cause damage so they must be washed away. However, this doesn’t mean that you can reach for that withered old bar soap. Ordinary soaps tend to be loaded with detergents and deodorizers and can be very harsh and dehydrating to the skin. A good facial cleanser is what you need. Men tend to have skin that is a bit oilier then women’s so find a cleanser that targets normal to oily skin for the best results. Remember, if you don’t cleanse your skin on a daily basis; the excess grime and oil could leave you with clogged pores and breakouts. Men, if you really want to see and feel a difference in your skin this next step is for you. Exfoliation is the process of removing the dead skin cells from the surface to reveal the new skin cells beneath. Think of an exfoliating scrub the same way you would a piece of light grade sandpaper. A few swipes on a jagged piece of wood and voila, you are left with a soft, smooth surface that looks like a brand new piece of wood. Our skin exfoliates naturally but, as we get older ,the process of exfoliation starts to slow down and we need to help it along. Exfoliation can also help clean out the yucky stuff that can get lodged in your pores. Choose an exfoliant that contains scrubby particles to help smooth the skin and eliminate dullness. The bonus of using an exfoliant is that it will also help soften your hair follicles which can result in a closer, less irritating shave. And the best part? This is a product that you only need to use a few times a week. Moisturizers can make a world of difference in the appearance of a man’s skin. 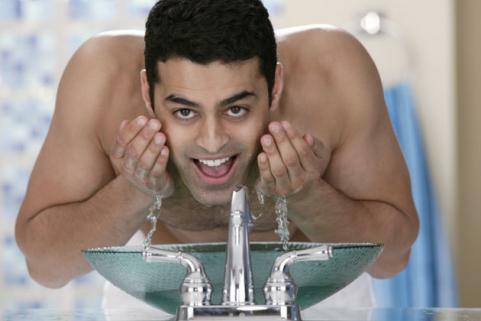 In fact, men tend to need moisturizer even more than most women do. This is because most men shave their faces. Every time you scrape that razor across your skin, you aren’t only removing facial hair but you are also removing necessary oils from your skin. Then what do you do? You probably slap on some alcohol-based aftershave lotion that burns the heck out of your skin. The alcohol then further dehydrates the skin. So what do you need to combat this? Moisturizer! A moisturizer will help to replenish your skin’s moisture content and will help prevent razor burn. Choose a moisturizer that contains SPF to help protect you from ordinary exposure to the sun’s damaging rays. Unprotected sun exposure can lead to pre-mature aging, fine lines, wrinkles and worst of all, skin cancer. One of the very first places we start to notice the signs of aging is around the eyes. And unfortunately, this is the very place that many men tend to neglect. The skin around our eyes lacks in both sweat and oil glands making it highly susceptible to dehydration which can show itself as fine lines and wrinkles. The super soft, very thin layer of skin that surrounds our eyes can develop little expression lines that may grow into unsightly wrinkles quickly. So what should you do? Pick up a hydrating eye cream right away. All you need is a little dab of product under and around each eye to do the trick. It will help hydrate, smooth and protect your skin every day. Apply your eye cream every morning and every evening before bedtime and after cleansing. Believe it or not, our lips age drastically with time. Take a look at a picture of yourself when you were a young child. Your lips were plump and there were no lines. Unfortunately, as we age our lips lose collagen and they start to melt right in with the rest of our face. Women can take advantage of lip liners, lip stick and lip glosses but many men draw the line at this! If you look at your lips in the mirror you will see fine lines and wrinkles running in all different directions. Our lips, like the skin around our eyes, also lack in sweat and oil glands. They do not have the same protective layer of skin called the stratum corneum that we have elsewhere on our bodies for added protection. And, because they also lack in melanin they lose that extra protection against the sun’s UV rays. Our lips desperately need our help.Men, grab a lip balm, preferably with SPF and as I always say; apply, apply and reapply throughout the day. See gentlemen, it’s really that simple! And the best part is that if you incorporate these five simple steps into your daily regimen, you will definitely notice a difference in your appearance. It’s a fuss free way towards healthy, handsome skin.